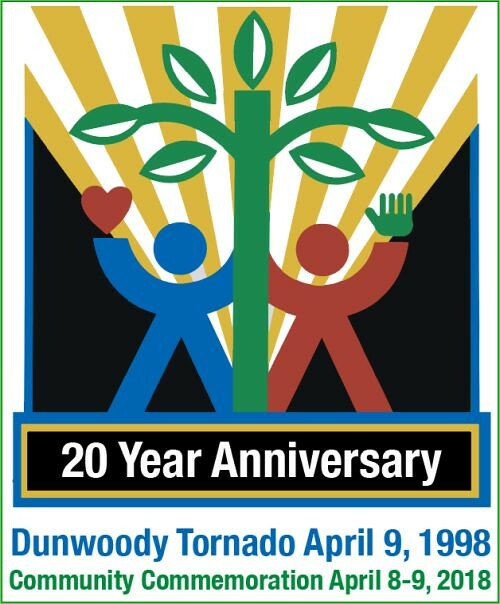 A 20th anniversary commemoration of the tornado that devastated Dunwoody on April 9, 1998, is planned Sunday and Monday, April 8 and 9. Coordinated by the Dunwoody Preservation, the City of Dunwoody and the Dunwoody Crier, events are free and open to the public. A community gathering will be held Sunday, April 8 at 2 p.m. at the Kingsley Racquet and Swim Clubhouse. A panel of guests to include former DeKalb CEO Liane Levetan, former members of DeKalb’s public works department Tom Brown and Tom Black, Dunwoody Mayor Denis Shortal will discuss the scope and rebuildig process that displaced 1500 Dunwoody families and destroyed 750 acres of land. A slide show and a display of photos and archives will be on exhibit before and after the presentations. On Monday, April 9, the community is invited to a tree-planting to be held at the Donaldson-Bannister historic property in commemoration of the the Replant the Dunwoody Forest initiative that brought 20,000 new trees back into the community following the tornado. The tree planting and plaque presentation will begin at 10 a.m. The exhibit and slide show will also be on display during Lemonade Days — also an off-shot of the Dunwoody tornado — scheduled April 18 – 22 at Brook Run Park. The Kingsley Racquet and Swim Club is located at 2325 N. Peachtree Way. The historic Donaldson Bannister House and Gardens is located at 4831 Chamblee Dunwoody Road.